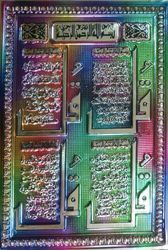 Providing you the best range of kalma - gold plated islamic embossed poster, allah - gold plated islamic embossed poster, mohammad - gold plated islamic embossed picture, char kul - gold plated islamic embossed picture, ayat ul kursi - gold plated islamic embossed picture and 99 names of allah - gold plated islamic embossed picture with effective & timely delivery. Available Size 9 x 18" & 10 x 28"
We are offering Gold plated Islamic Embossed Pictures. These pictures are made using laser-cutting technology. We are offering Allah - Gold Plated Islamic Embossed Poster. These pictures are made using laser-cutting technology. 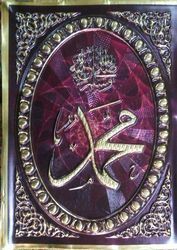 We are offering Mohammad - Gold Plated Islamic Embossed Picture. These pictures are made using laser-cutting technology. We are offering Char Kul - Gold Plated Islamic Embossed Picture. These pictures are made using laser-cutting technology. 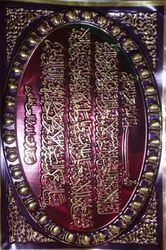 We are offering Ayat Ul Kursi - Gold Plated Islamic Embossed Picture. These pictures are made using laser-cutting technology. 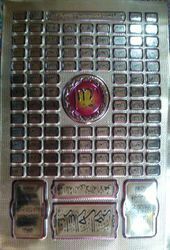 We are offering 99 Names of Allah - Gold Plated Islamic Embossed Picture. These pictures are made using laser-cutting technology. 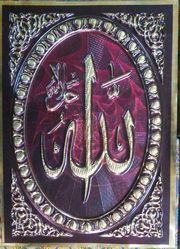 Size 9 x 18" & 10 x 28"
We are offering Mashallah - Gold Plated Islamic Embossed Picture. These pictures are made using laser-cutting technology. Looking for Gold Plated Islamic Embossed Posters ?